Buy Naturtint Permanent Hair Colourants - 4G Golden Chestnut in the UK from our online shop or directly from our independent Scottish store. This market-leading brand of permanent home hair colourants. FREE FROM ammonia, resorcinol and parabens. Formulated with active vegetable ingredients, providing optimum colour and care for your hair. Choose from over 25 different colours, all of which can be mixed to create an endless palette of colours and used for more than one application (not for very long hair). All shades cover 100% of grey and can lighten hair by up to 2 shades. As official Naturtint stockist, we sell genuine Hair colourants directly from our shop in Scotland and online throughout the UK. Naturtint's plant-based permanent hair color is unlike any typical at-home hair dyes. Their natural hair colouring products are eco-friendly, ammonia-free, paraben-free, and vegan friendly. View more products from Naturtint. Where can you buy real Naturtint 4G Golden Chestnut safely online? 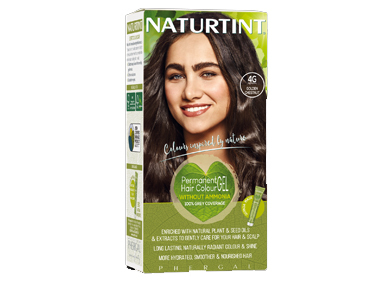 If you are wondering where you can buy Naturtint Permanent Hair Colourants - 4G Golden Chestnut safely online in the UK, then shop with us. We are an actual health foods shop; with real people selling real foods and products. Our award-winning independent shop is located in Stirling, Scotland since 1976. You can buy our Natural hair colouring and other genuine Hair colourants in store or safely place an order with us online or over the phone. Naturtint 4G Golden Chestnut - Naturtint Permanent Hair Colourants - 4G Golden Chestnut in Hair colourants and Hair Care.